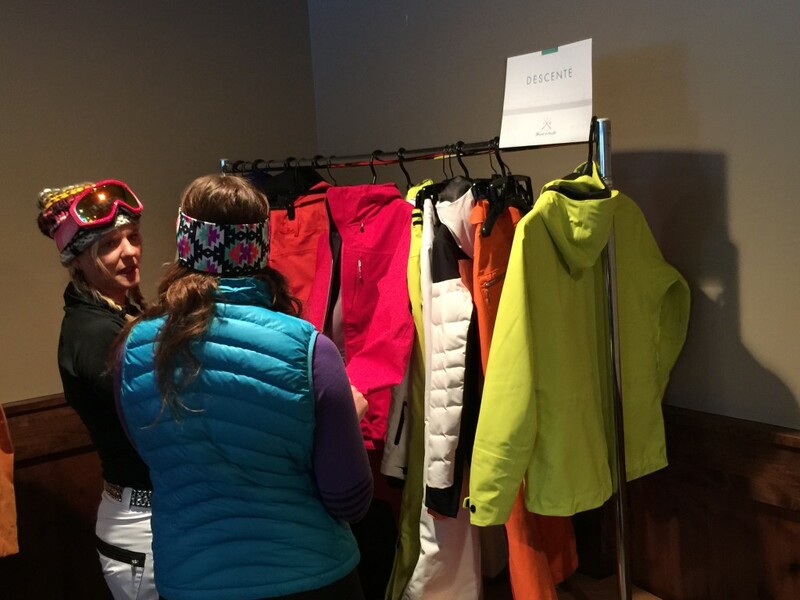 The annual Winter Outdoor Retailer (OR) show kicks off Tuesday at Solitude Mountain Resort with an on-snow demo, but a mixed group of magazine writers, representatives from 14 apparel brands, and tagalongs like me, were gathering at Solitude several days in advance. The event the 50 or so of us are here for, hosted by Powder Magazine and dubbed “Thread the Needle,” is one of many events that happen before or after the show. Save for the single on-snow demo day, OR is primarily located downtown. 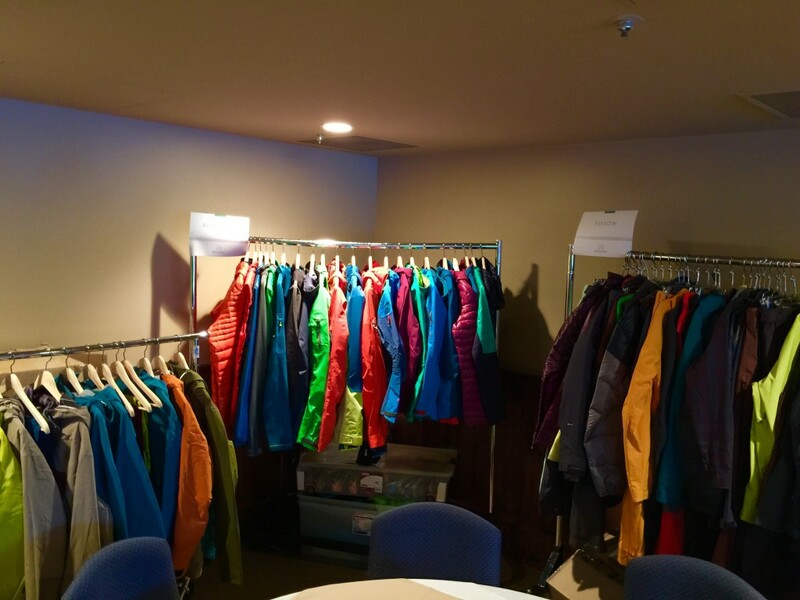 But, the fortunate timing having such a large cross-section of the outdoor industry in one zipcode at the same time has naturally produced opportunities away from the show. The economic impact of the OR show itself is not in dispute. Statistics provided by Visit Salt Lake estimate delegate spending for a four-day show is over $900/attendee. Multiplying that by the expected 20,000 attendees you can see why OR has such a positive impact on the downtown economy. Events like Thread the Needle are bringing additional people, as well as dollars and visibility, 45 minutes away from downtown to Solitude. The rising tide of OR, can and does lift all ships—Solitude in this analogy. For those familiar with Powder Magazine (if not, head over to powder.com and sign up for a subscription—ski mags are best in print) you may have heard of Powder Week. Essentially, the magazines editors, writers and contributors take over Jackson Hole’s base area (Note: Big Sky will host in 2015) with a tent large enough to store a yacht to test nearly all of the coming year’s skis. Brand representatives share lift rides with reviewers to point out the technology and features of skis not yet available to the public on the way up. They’ll race to the bottom and repeat with a different set of boards and a new rep. 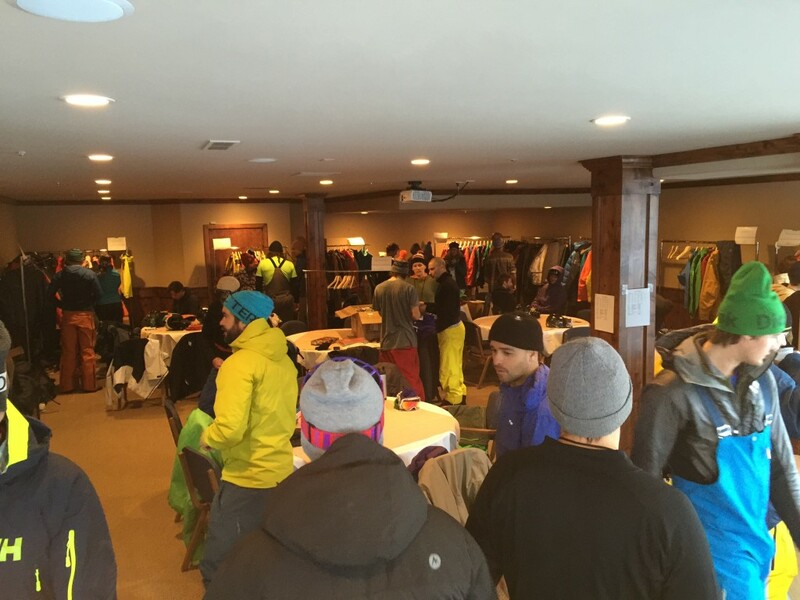 While Thread the Needle (TTN) is not Powder Week, TTN is an opportunity for apparel manufacturers to show their wares to the Powder staff. 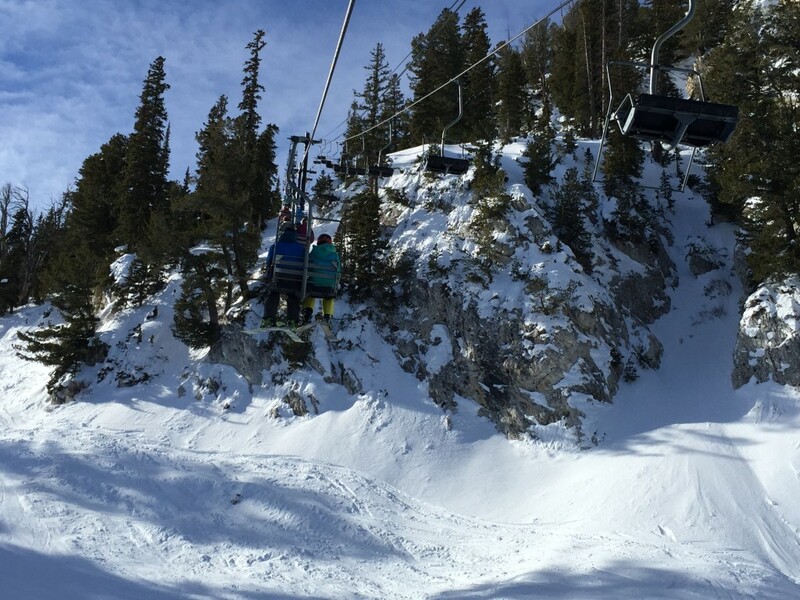 With many of these vendors already planning to be in SLC, as well as key writers and editors for Powder Magazine, tacking a few days onto everyone’s OR trip made the most sense. The idea was hatched in 2012, with the inaugural event taking place over two days at Solitude. According to Powder Publisher Ashley Otte, Solitude is an ideal location due to the “uncrowded village that allows us to take over a space, and the centralized base facilities no one gets lost finding,” which allows their group to connect on and off the mountain. Rack and racks of next year’s technical shells. Looks like skittles are still favored over earth tones. Now in it’s fourth iteration, Thread the Needle has spilled over to neighboring resort, Brighton on Saturday night. Kicking off the event with a night of skiing in jeans and wool knickers under the lights, the irony of skiing in denim prior to two days of donning technical shells that retail for upwards of $500, is a great way to break the ice. 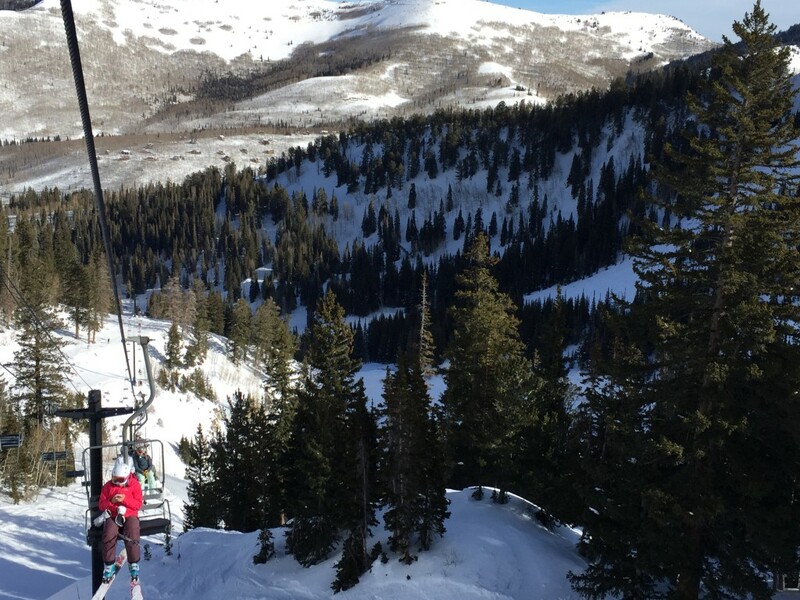 Come Sunday morning, several dozen skiers and boarders will be skiing, skinning, bootpacking and hiking around Solitude in jackets, ski pants and base layers that won’t hit shelves until next fall. For Caley George, of Eddie Bauer, outfitting writers from the “skier’s magazine” with their product first-hand is valuable, as well as the opportunity to tell the story of the 95-year-old brand. I tag along with a team of three, trying out a hardshell and softshell coats that will be on sale in 2016 from Eddie Bauer’s First Ascent line. The advantages of tri-laminates, Neo shells, DWR and wicking technology Caley is explaining are over my head, but Powder Editor John Stifter is nodding in approval and firing right back with metrics also beyond my comprehension. On a single lift ride Caley told us the history of Eddie Bauer the person, who was a tough-as-nails North West guy in his own right, as well as explained the various lines within the brand. By the time I figure out how to close the pit zips, we’re heading down one of Solitude’s empty groomers. It may as well be our own private resort and testing ground. Caley and Abbie chat about Eddie Bauer’s First Ascent line. I asked John Stifter why, in his opinion, Thread the Needle is a benefit to his staff of writers. He explained the event ”not only aids us in providing legit product reviews for our annual apparel guide, but it allows us to get out and ski with manufacturers and learn about each other while skiing and riding chairlifts.” After skiing for the day, the group convenes at Solitude’s village bar to trade notes on which gear to check out tomorrow over a few beers. You can’t help but notice our crew—still a few dozen strong—had taken over the lone watering hole at the resort. Without Thread the Needle in town, Solitude would have truly lived up to the name “Solitude” on and off the mountain. By the time our tab is paid, I can attest the bartender would agree the OR show, still two days away, made her night in dollars and cents. Maro from Eider takes notes on feedback from the last run the chair. When Powder Magazine hits mailboxes next fall, readers can trust the apparel reviews and recommendations were done by the writers themselves, in actual skiing conditions. 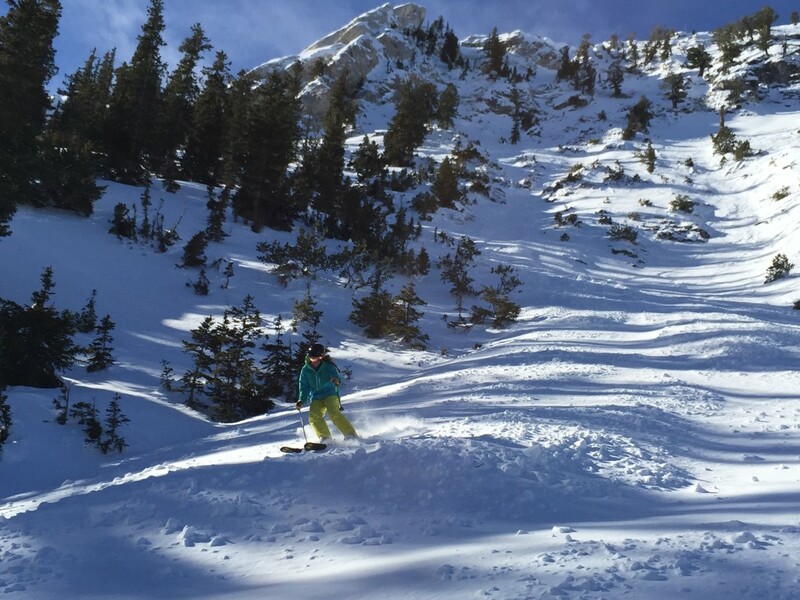 Maro LaBlance of Eider, sees multiple benefits to Thread The Needle: “Besides getting quality face time with Powder editors, we’re able to get valuable product feedback, talk shop with other brands and enjoy a couple days of skiing before the shows,” she said. The Powder team also shot a series of videos with each of the brands, so their reps can explain the features of their gear directly to consumers on powder.com. If you get a lame color, though, don’t blame Powder—that one’s on you. Colors. You must choose wisely.